Part three in the series about the psychological dimension of the conflict. Underlying the Israeli-Palestinian conflict are the scars that each side carries from their respective traumatic pasts. Their perceptions of each other were engendered by their independent religious traditions as well as their historical experiences as they related to one another. Unfolding events — violence, mutual recrimination etc. — between Israelis and Palestinians over the past seven decades, however, have made it virtually impossible for them to settle their differences. Maintaining an adversarial mindset toward each other has thus provided the justification and rationale to perpetuate their historical grievances through constant rancorous public narratives, placing the blame for the continuing discord on the other. The Jewish experience throughout the Diaspora was one filled with discrimination, persecution, anti-Semitism, and expulsion culminating in the Holocaust. The genocide perpetrated during the Holocaust was surely something new in history: never before had a powerful state turned its immense resources to the industrialized manufacturing of corpses; never before had the extermination of an entire people been carried out with the swiftness of an assembly-line. The fact that many Jews were prevented from avoiding death camps by immigrating to Palestine added yet another layer to the horrific experiences of the Jewish people. The Jews have carried the scars of this past with them and still hold to the view that it can happen again unless they remain vigilant and relentless in protecting themselves at any cost. With this past in mind, the establishment of the state of Israel was seen not only as the last refuge to provide protection for the Jewish people but also the realization and hope of both secular Zionism and biblical prophecy (i.e. the return of the Jews to their ancient homeland). Thus, religious and non-observant Jews believe this trust must be guarded with absolute and unwavering zeal. Yet, this historical sense of victimization and injustice has served to nurture the allegiance that each Israeli feels towards the state and each other with naturally-engendered, negative emotional sentiments towards the enemy. From the Israeli perspective, the establishment of Israel on the heels of the Holocaust was seen (and continues to be viewed) as the last chance to create a refuge; they must therefore remain on guard to protect Jews’ welfare and wellbeing wherever they may live and at whatever cost. This sense of being victimized resulted from an intentional infliction of harm in the past, universally viewed as utterly unjust and immoral. Yet, it has led to a lack of empathy towards perceived enemies; for example, it manifested itself in Israel shirking responsibility for the Palestinian refugee problem and violating human rights, all the while promoting self-righteousness. Compounded, these conditions inherently endure, particularly when accompanied by extensive and continuing violence against Israel and growing concerns over national security. They are further strengthened by the Palestinians’ public narrative, which openly promotes the rejection of the very existence of the state. The Palestinians, for their part, have hardly made any serious effort to comprehend and appreciate the psychological implications of the Jews’ historical experience of religious persecution. Instead of understanding the Israeli mindset that was formed by the horrific past, the Palestinians have either denied the Holocaust altogether, or bemoaned that it did happen. It is not that the Palestinians should be held responsible for the Jews’ historic tragedy, but they failed at a minimum to appreciate the Israelis’ mindset in effectively dealing with the conflict. Either way, over 700,000 Palestinians found themselves as refugees, an experience that has lasted for decades and continues to endure, leaving an indelible impression on their psyche; currently, nearly 5 million Palestinians are refugees. This traumatic experience served to bind Palestinians together in the same way that the Jews coalesced following the Holocaust, with each side believing their tragic historical experiences are unparalleled in scope and magnitude. The fact that the Arab states manipulated the Palestinian refugee problem over many decades to their advantage does not change the reality on the ground; it did not alter the Palestinians’ mindset, their perception of what the Israelis have done, or their sentiment and disposition about their plight. Subsequent and frequent violent encounters between the two sides, especially after the 1967 war, further aggravated the Palestinian refugee problem. This war not only created another wave of refugees, but also set the stage for a bloody confrontation, during which many thousands lost their lives on both sides. The Israeli settlement project provided daily blows to Palestinian pride while demonstrating the futility of their efforts to stem Israeli encroachment on their territory, especially in the West Bank. The occupation and the repeated humiliation of the Palestinians further deepened their resolve to oppose the Israelis at whatever cost, but all was to no avail. The Israelis have proven to be a formidable foe and the Palestinians’ resentment, hatred and animosity have naturally only increased. Israelis have never fully understood the significance of what the Palestinians have been enduring, how this has impacted their psychological dispositions, and why they have shown no desire to reconcile their differences with Israel. Israelis often argue that since nearly 800,000 Jews left their homes (or as many believe, were forced out) across the Arab Middle East and North Africa and largely settled in Israel, the Palestinian refugees must be considered a de-facto swap with the Jewish refugees. This view not only dismisses the historic trauma experienced by the Palestinians, but also disregards their national aspirations to establish a homeland of their own, especially in light of the 1947 UN resolution (known as the Partition Plan) which called for separate Jewish and Palestinian states. This psychological fixation, reinforced by public narratives and education in schools, has prevented either side from coming to grips with the inevitability of peaceful coexistence. Understanding the Israeli and the Palestinian mindsets from the historical perspective is central to appreciating their respective resistances to change, which is detrimentally empowered by their historical experiences, especially if they continue to harbor political agendas that overshoot what they can realistically attain. That is, will their historical experiences, bequeathing a sense of mutual victimhood, be mitigated by the changing reality, or will they hold onto it until they achieve their objectives, however illusionary they may be? Indeed, do the Jewish people’s and the Palestinians’ unprecedented historical suffering — although they do not fall into the same category — somehow ontologically elevate them from “victims” to “Victims,” guaranteeing them, and by extension contemporary Israelis and Palestinians, an unconditional status of moral untouchability? The French philosopher Alain Badiou is right to suggest that we need to question the presumption “that, like an inverted original sin, the grace of having been an incomparable victim can be passed down not only to descendants and to the descendants of descendants but to all who come under the predicate in question, be they heads of state or armies engaging in the severe oppression of those whose lands they have confiscated” (Polemics, 2012). Indeed, the victim mentality has become a political tool in the hands of those who seek to promote their interests at the expense of the opposing political parties, not to mention the enemy. The Palestinian culture of victimhood, on the other hand, was equally divisive in that it perpetuates the refugee problem by promoting popular refusal of permanent resettlement. Palestinian leaders have also used it as a tool for public indoctrination, ensuring that the Palestinian plight remains central to any political and social discourse. Palestinians and their leaders have carefully and systematically ingrained their victim mentality in the minds of one generation after another through the media, schools and places of worship. Israelis and Palestinians alike (especially those who, like Hamas, seek the destruction of Israel) must become more self-critical in their use of victimhood; both sides need to realize that neither has a monopoly on the position of “the victim,” and neither is granted a morally unimpeachable status as a consequence of their historical experiences or the shifting realities on the ground. The effect of adverse historical interaction, however, can be mitigated over time or reconciled through dialogue, eventually leading to changes in perception. 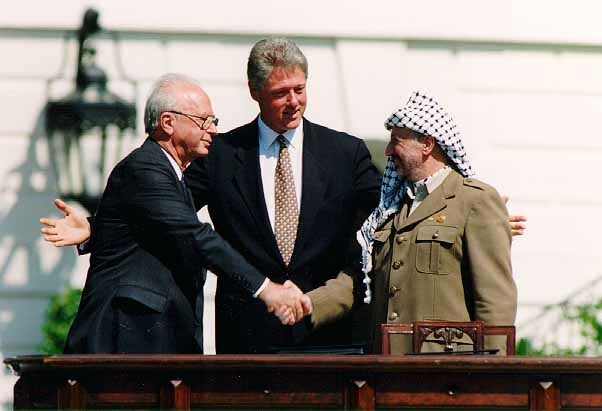 Notwithstanding their traumatic historical experiences, neither the Israelis nor the Palestinians can or should use history to foreshadow the present requirements to make peace. Historical experiences can be both instructive and destructive; a student of history must learn from past experiences but not emulate them and thus obscure a contemporary reality that can no longer be mitigated short of a catastrophe, in particular Israeli-Palestinian coexistence. The Palestinians have every right to demand the immediate end to the occupation and live with dignity; Israel has equal rights to satisfy its legitimate national security concerns. These two requirements are absolutely compatible and provide the only basis on which to build a structure of peaceful coexistence. Without denying the Jews’ and Palestinians’ sense of victimhood, perpetuating their conflict ironically creates new generations of victims, robbing them of their future only because their elders want to cling to the past. Part two in the series about the psychological dimension of the conflict. On the surface, the deadlock in the Israeli-Palestinian peace process seems illogical and unsettling. After all, a majority of Israelis and Palestinians realize the inevitability of coexistence and presumably understand the general parameters of a negotiated peace agreement: a two-state solution based on the 1967 borders with some land swaps, Jerusalem would remain a united city (but a capital of two states), and the vast majority of Palestinian refugees would be compensated or resettled in the newly-created Palestinian state in the West Bank and Gaza Strip. These fundamental imperatives, coupled with appropriate security guarantees for Israel, represent what was on the negotiating table, in 2000 at Camp David and in 2008/2009 in Jerusalem and Ramallah, with each round coming closer to finalizing an agreement yet ultimately failing to do so. The answer lies far beyond the political concessions on the ground and is deeply embedded in the psychological dimension of the conflict, which impacts every conflicting issue between the two parties. This dimension is at play here: biased and selective perceptions, reinforced by historical experience, religion and incompatible ideologies, have locked both sides into immobile positions. The factors that maintain and enhance these patterns include emotions such as fear, distrust and insecurity; the psychological outcome is mutual denial of the narrative of the other and mutual delegitimization. Put together, the operative result is stagnation and polarization. What is therefore needed is a consensus-oriented dialogue at the leadership level, by both officials and non-officials, to resolve the issues of perception — a tall order given the current environment that buttresses rather than ameliorates perceptions. We call a belief an illusion when a wish-fulfillment is a prominent factor in its motivation and in doing so we disregard its relations to reality, just as the illusion itself sets no store by its verification. They are derived from deep human wishes. The belief is held (or would be held) in the absence of any compelling evidence, or good rational grounds, in its behalf. It is impossible to deny that both Israelis and Palestinians are in the grip of very powerful illusions which only serve to prolong the conflict and prevent any mutual understanding. What are some of these illusions, or pipe-dreams, as the great American playwright Eugene O’Neill would call them? Following O’Neill, we can distinguish between pipe-dreams of yesterday and pipe-dreams of tomorrow. For example, the belief shared by many Israelis that they have a biblical right to the land (the ancient biblical lands of Judea and Samaria) and that God gave the Jews this land for all time is undoubtedly an illusion or a pipe-dream of yesterday. It is not affirmed because there is any real evidence for it, but because it satisfies a deep-seated psychological need for a God-given Jewish homeland. The belief that by expanding the settlements Israel will augment its national security is a pipe-dream of tomorrow. It is important to note how these illusions sustain and reinforce one another, and constitute a psychological barrier which is that much more impervious to critical reflection. Israel’s illusions have served to create the logic for occupation, ultimately perpetuating the dehumanization of the Palestinians. The Palestinians, for their part, are not without their own illusions. They believe, for example, that God has reserved the land for them, and appeal to the fact that they had inhabited the land for centuries. The presence of the al-Aqsa Mosque and the Dome of the Rock in Jerusalem attest to their unmitigated historical and religious affinity to the Holy City. They also cling to the idea that they will someday return to the land of their forebears, as they have and continue to insist on the right of return of the Palestinian refugees, even though this has become a virtual impossibility. The Palestinians cling to their pipe-dreams of yesterday and tomorrow just as blindly and desperately as the Israelis, which leads to resistance to and fear of change. This has contributed to making the Israeli-Palestinian conflict both chronic and intractable, as the various illusions are continuously and consciously nurtured by the daily encounters between the two sides. It would thus appear that the psychological concept of resistance to change is extremely relevant as well. First, a distinction is needed between resistance to persuasion, which is conscious and deliberate, and inner unconscious resistance to change. In his essay, “The Psychological Dimensions of the Israeli-Palestinian Conflict: the Role of Psychological Resistance,” David Rabinowitz, one of Israel’s leading psychiatrists, observes that an important function of unconscious resistance is that it is protective in nature. In seeking bridging concepts that could link between the domains of psychology and politics in the Israeli-Palestinian conflict, it could be proposed that a collective mutual resistance to change protects a vulnerable identity. Compared to the stable and mature political identities of the American, British and French nations, the political identities of both the Israeli and Palestinian peoples are, in a way, in their adolescence. Identities in this setting are more vulnerable, and the protagonists are naturally more defensive and resistant to change. By its very nature, the players must find it difficult (if not impossible) to articulate this publically, as to do so is to admit to this vulnerability. The concept of psychological resistance to change may well affect the political setting in general and the Israeli-Palestinian conflict in particular; it is closely connected to perceptions at many levels. Indeed, the psychological resistance provides protection for vulnerable identity formation in the Israeli-Palestinian conflict. It is this mindset, strengthened by historical experiences, which transcends the more than nine decades since the Israeli-Palestinian conflict began. The individuals and groups, Israelis and Palestinians alike, have and continue to interpret the nature of the discord between them as “you versus me” in a prejudiced and selective way. In turn, this has stifled any new information and enabled the continuing resistance to change, which could shed new light on the nature and the substance of the conflict and help advance the peace process. The concept of unconscious resistance to change in this setting links well to the view of perceptions driving the polarization in the conflict. Historical experience, which formulates perceptions, serves among other things to enhance the sense of identity of “who we really are,” a formative collective assumption that sits at the bedrock of both key players and drives functional and dysfunctional behavior. As Rabinowitz puts it, “the central benefit of this powerful unconscious resistance to change provides is the protection of a relatively vulnerable core identity [primary gains]. Secondary gains, however, are essentially the side-effects of the chronic polarization of this conflict: powerful allies offering material and political support [the US’ support of Israel and moderate Palestinians versus Iran’s support for Palestinian militants such as Hamas], engaging in alluring narratives, public attention and useful alliances etc.” In principle, such a mindset prevents either side from entertaining new ideas that might lead to compromises for a peaceful solution. The paradox here is that majorities on both sides do seek and want peace, knowing full well that this would require significant concessions, but are unable to reconcile the required concessions with imbedded perceptions that have precluded these compromises as a result of resistance to change.